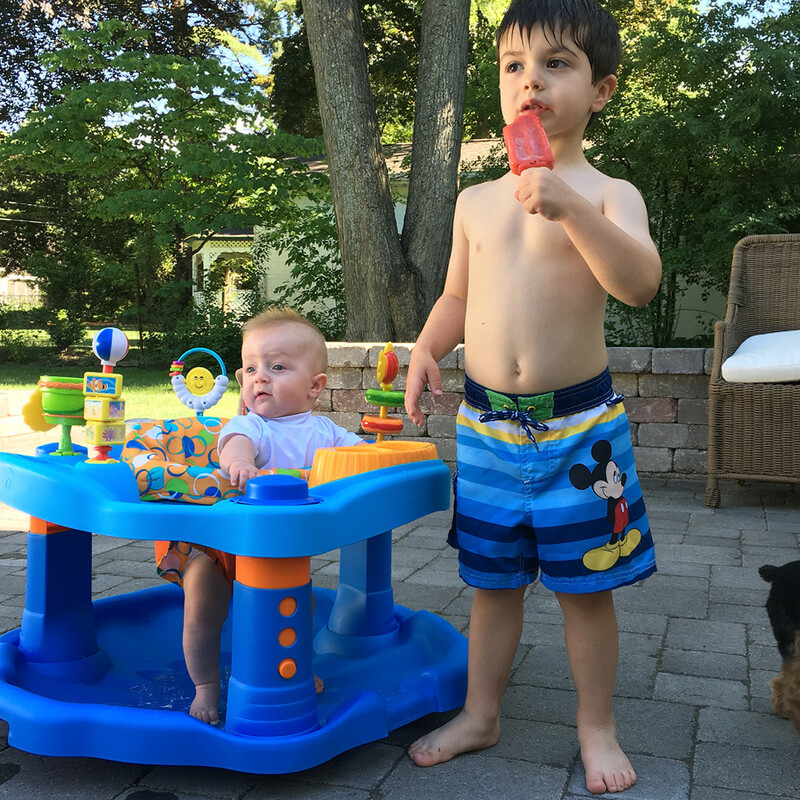 With two kids at very different stages, we’ve been trying lots of new products, specifically for outdoor time and pool days. Keeping things easy and cool is my goal, along with providing as much sun protection as I can possibly manage. I’m that obsessive mom who is constantly putting hats, sunscreen and sun protective clothing on her kids. If you see me at the pool, just be aware that I totally know that I’m being this way! Swimways Pool Float // We never one of these pool floats for Jackson but we wasted no time on getting one for Dylan – live and learn, I guess! I actually saw a girlfriend from college post a photo of her baby in this Swimways float and I immediately asked who made it and where I could get one. 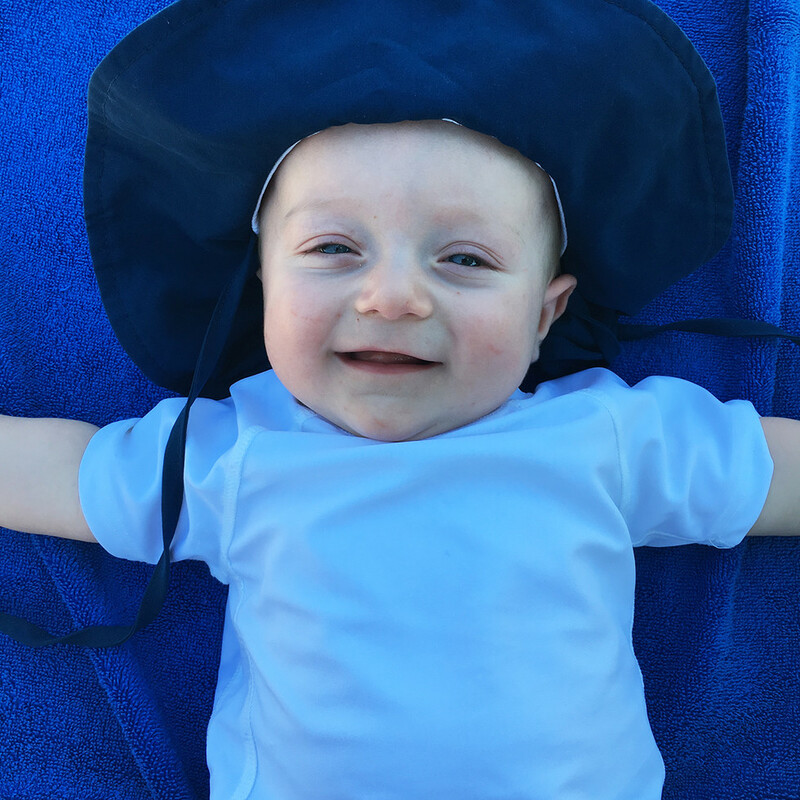 Since you’re not supposed to use sunscreen on babies under 6 months old, I wanted to find something that would provide even more shade for Dylan (he also wears a giant baby UPF 50 hat and rashguard) when we have him at the pool this summer. I do have to hold him up when he’s in this float because it’s way too big for him (as are most things at this point – he’s a tiny little thing! ), but I really like having it for him so he can play and be a part of everything we’re doing at the pool. Cabana Life Swimwear // Cabana Life is my absolute favorite brand for kids swimwear! I like their stuff for women, as well, but I’ll talk about that another time. For my boys, I like the rashguard and trunk sets and the infant rashguard onesies. I’m not great at shopping for little girls, but these little swimsuit and coverup sets are really adorable! Stroller Fan // When we lived in Houston, one of the first “stroller accessories” I purchased was this stroller fan. I’m not sure what happened to it when we moved but I just ordered another one to use with Dylan. It’s not super strong but it is really nice for circulating air for little ones when you’re on a walk and I plan on picking up this one, as well. I’ll use them on walks, to clip on the exersaucer when we’re playing outside or maybe even on the carseat if we’re at restaurants where it’s warm. Beautycounter Sunscreen // I heard about Beautycounter from one of my girlfriends who recently started selling the products. I haven’t had great luck in the past shopping from these “consultant” type businesses but my friend, who also has little ones, highly recommended trying the sunscreen and the sunscreen stick. If you’ve been reading here for a while, you know I’m a bit obsessive about sunscreen, so I’m always willing to give a good one a try. 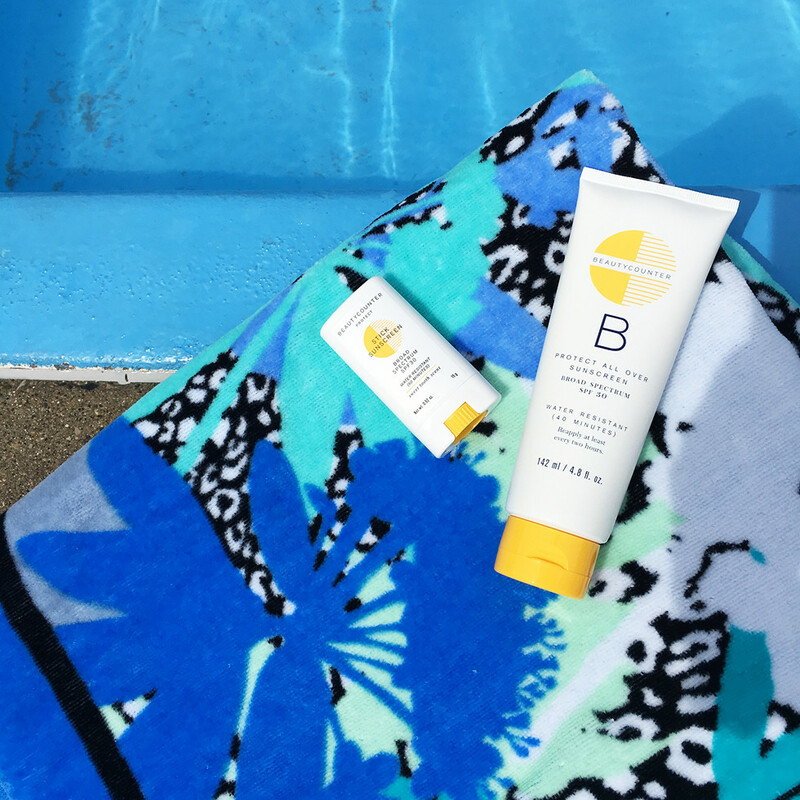 The Protect All Over sunscreen is really light, smooth and easy to apply, and both Jackson and I tried it. I did still use our “no tears” drugstore sunscreen on Jackson’s face. They do tell you to reapply every two hours or after 40 minutes in the water, so I did do that. We had good results from using it, no sunburns and no complaints with reapplying! The sunscreen stick is quite possibly my new favorite addition to the diaper bag! 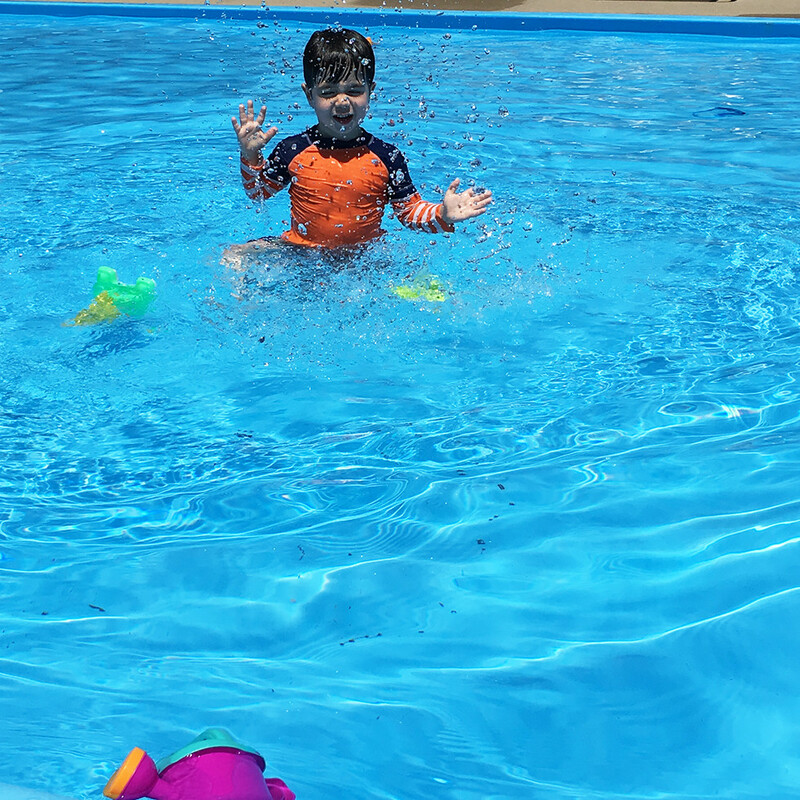 Dylan isn’t wearing sunscreen yet, but it’s great to have for Jackson in those cases where we’ve found ourselves spending more time outside than expected, or just for a quick reapplication. I’ve used it for myself too for quick touchups. I just put mine on over my tinted moisturizer or BB cream, and it didn’t seem to take that off. The stick also has a “sweet tooth” scent which I was concerned would be overpowering but it’s actually really light and feels summery to me, so I was a fan! The giveaway will close at midnight on Sunday, July 24. Good luck! We love to swim with out three boys several times a week. I am part of Lisa’s beauty counter group and like the HSS Feed. Thanks!